Dr Jezdimir Knezevic, is a world class researcher, educator and entrepreneur. Over 400 publications disseminated world-wide through books, papers, monographs and reports are attributed to his name. In addition, he has delivered numerous technical presentations, key note addresses and speeches; has been congress, conference, symposium chairman, track leader, workshop presenter, round table moderator on many hundreds international events which took part in all six continents in over 40 countries. He has been elected as a Fellow, Member or Official of many leading Professional Societies and Institutions worldwide, and has been actively involved in editorial work with the world’s leading and prestigious referred journals and publishing houses. Dr Knezevic has received several international awards for his contribution to research and education in the field of Logistics Engineering including the prestigious Armitage Medal ("Awarded to recognize outstanding contribution to logistics literature." 1993) and Eccles Medal ("In recognition of his outstanding achievements in the development of Logistics Education", 1996) from the Society of Logistics Engineers, SOLE, in USA. In 2010 The Society for Reliability Engineering, Quality and Operations Management awarded the Lifetime Achievement Award, to Dr Knezevic "for global leadership and pioneering research excellence in Mirce Mechanics". Encouraged by the excellent response from industry to his research and educational activities, in 1988 Dr Knezevic established a self-financing Centre for Management of Industrial Reliability, Cost and Effectiveness, MIRCE, at Exeter University, UK. Together with his colleagues, he has developed and delivered over 100 vocational courses and 12 international summer schools for practitioners from industry. Under his leadership, the Centre has attracted over 3000 professional engineers and managers and generated an income in excess of 3 million US dollars. In 1991, Dr Knezevic developed and introduced the first Master of Science Degree in Logistics Engineering in the United Kingdom, at Exeter University. This was followed by the first Master Programme in Reliability and Maintainability Engineering, in 1996, and finally, in 1997 the first Master Programme in System Operational Effectiveness. Through these programmes he has directed and supervised over 150 postgraduate students, holding senior positions in leading global giants including Lockheed Martin, Rolls Royce, British Aerospace, Thomson Training & Simulation, GKN Westland Helicopters, Short Brothers, Martin- Baker, RACAL, United Defense, Kongsberg Defense, Alvis Vehicles (GKN Defence), EDS, Siemens Plessey, Lucas, Chelton Electro-Statics, Royal Air Force, NAMSA, South African Navy, Vickers, GEC Marconi, British Army, Yarrow Shipbuilders, Taiwan Air Force, Royal Norwegian Air Force, University of Singapore, Sentient Systems, Vickers Shipbuilding and Engineering. 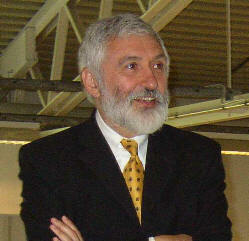 In 1999 Dr Knezevic formulated the concept of MIRCE Science, the scientific theory of motions of functional systems through MIRCE Space, resulting from physical causes and human actions, which enables predictions of in-service reliability cost and effectiveness.. To fully focus on the further development, dissemination and application of MIRCE Science, he left Exeter University to establish the MIRCE Akademy, at the Woodbury Park, Exeter, UK. Under his leadership, the Akademy has educated thousands of professionals coming from Industry, Government and Military Organisations world-wide. Some of them have received internationally recognised Master or Doctoral Diplomas. Dr Knezevic regularly provides services to private and public sector organisations regarding their needs for managing in-service reliability, cost and effectiveness, for a given system structure, operational conditions, maintenance policies and support strategies, based on scientific understanding of the causes and mechanisms of occurrences of in-service phenomena and actions. Dr Knezevic holds Bachelor, Master and Doctoral degree from Faculty of Mechanical Engineering, University of Belgrade, Yugoslavia. He shares life with Lynn, is passionate about motorsport, is challenged by rusty, but beautiful Lancia rally cars, and enjoys living in a XVI century built thatched cottage in tranquil village of Bickleigh, Devon, England.